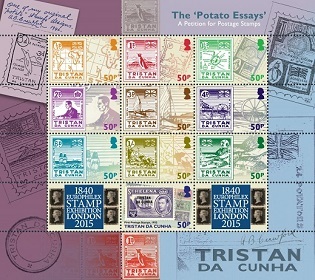 This sheetlet shows nine stamps designs, with face values in pence and potatoes, submitted by Allan Crawford with the petition for Tristan da Cunha to have its own postage stamps. Also featured is Tristan's first official stamp. This sheetlet shows nine stamp designs, with face values in pence and potatoes, submitted by Allan Crawford with his 1946 petition to the UK Postmaster General for Tristan da Cunha to have its own postage stamps. Also featured is Tristan's first official stamp, the overprinted St Helena definitive. The issue is to be launched at the Europhilex Stamp Exhibition London 2015, which marks the 175th Anniversary of the Penny Black.